Modern features in a Fantastic Tahoe Vintage Cabin with garage. 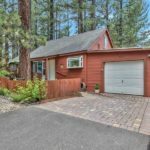 You can have it ALL in this Great cottage style 2 bedroom cabin with a converted shed that provides an additional sleeping area in the Heart of South Lake Tahoe. Located a few blocks from Lake Tahoe, restaurants and shops. OR, drive 3 minutes to the Heavenly Lodge for a day of skiing. Enjoy the beautiful backyard that boasts mature native species, hot tub and fire pit. Home has gorgeous newer Siberian Oak wood floors. A newer paver driveway adds to the curb appeal of this sweet cabin. Come take a look today, you won’t be disappointed! This entry was posted on Thursday, September 13th, 2018 at 6:49 pm and is filed under Rover IDX Property, Updated Property. You can follow any responses to this entry through the RSS 2.0 feed. Responses are currently closed, but you can trackback from your own site.